Monopoly Live Dream Catcher Edition has been developed by Evolution Gaming as a hybrid Live RNG Game. This new game brings together the best of live streamed gaming with an RNG bonus round that provides the potential for massive payouts. 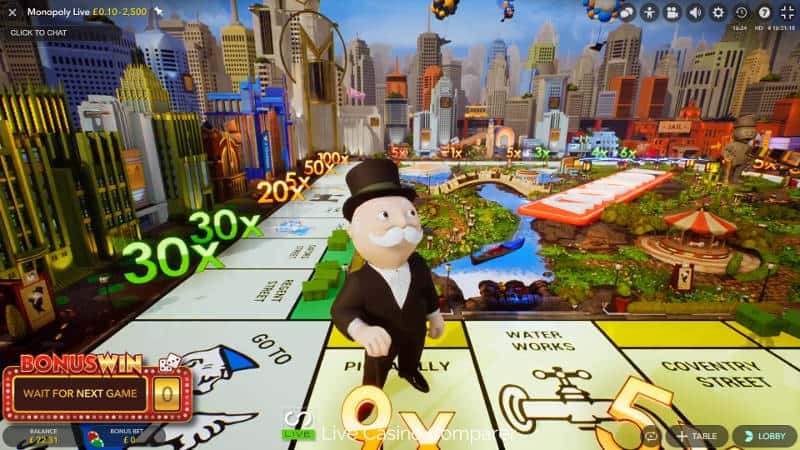 Monopoly live is one of those games that needs to be played with a playing strategy. Without one you’ll miss the huge potential this unique game offers. That’s why I’ve created a section below to cover a Monopoly Live playing strategy. The original Live Dream Catcher Wheel has been modified to include additional win segments. When the wheel stops on one of these special segments a 3D RNG Bonus round is initiated, hosted by Mr Monopoly. To qualify for the Mr Monopoly Bonus Round you must have an active bet on a “2 ROLLS” or “4 ROLLS” segment when the wheel stops on it. What’s special about Monopoly Live Dream Catcher? Put simply, Monopoly Live Dream Catcher is all about the Monopoly Board Bonus Round. To give yourself the best chance of getting the Bonus Round you must follow a playing strategy. 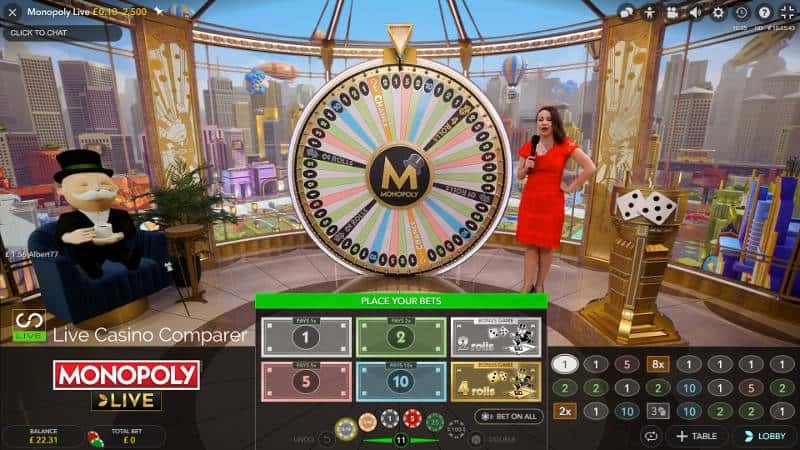 Bringing together the Live Dream Catcher Wheel of fortune and an RNG driven bonus game based on Monopoly, is pure genius. While the base Dream Catcher game is very playable, the whole game comes alive when the Monopoly Bonus Round is initiated. Once in the Bonus round you can win Multipliers & Cash Prizes and an opportunity to double the lot if you Pass Go. If you play Slots and love Bonus Rounds, this is the game for you. Do you want to be entertained?, this is a game for you. To experience the best of Live presented games with a twist, play this game. If you just love Monopoly, either the slot or board game, you should give this a try. Treat it like a slot game, in that you have to feed it money until you hit the Bonus round. Don’t expect to win big on the base game because you won’t, unless you’re lucky to get a Chance Multiplier. Just be content with Turing over your bankroll until the Bonus round is triggered. If you want to play in the Bonus Round you need a strategy to do so. There is no wonder strategy that will guarantee you’ll win. If anyone says so they are lying. But you will need a strategy to get the chance to enter the bonus round. Understanding the probability of hitting the Bonus Feature should help determine when it’s time to start betting. The “2 ROLLS” and “4 ROLLS” feature will happen on average every 13.5 spins. (There are 4 feature segments on a 54 segment wheel). Check out the previous spins to see when the Bonus Feature was last hit. Start placing your bets if the bonus hasn’t hit for the last 12 spins. 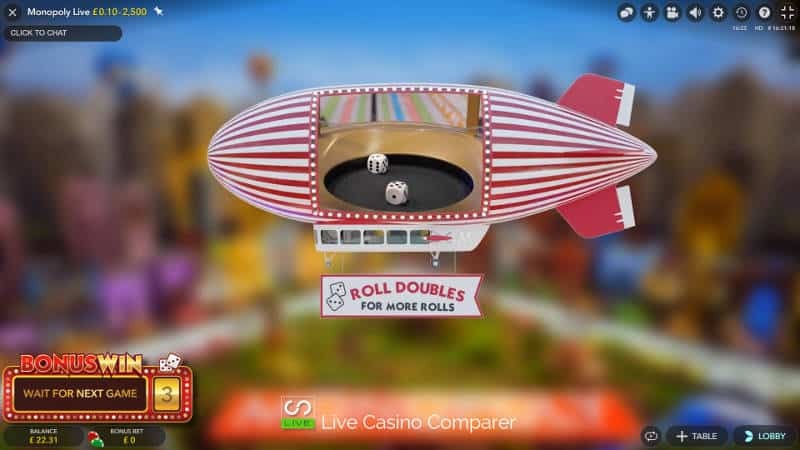 Bet on the 2 Rolls and 4 Rolls segment on every spin. Place as much money as you’re willing to lose. Don’t count on hitting the bonus round immediately. The payouts for the Bonus Rounds will be fair but are volatile. You’ll make the best payouts with the 4 ROLLS feature, the potential is huge. For that reason Evolution has capped wins at €500,000. The game plays slowly, so not like a slot where you can burn through money in 100’s of spins. Set a bankroll and stick to it, the more money you bet on the bonus segments the more you stand to win during the bonus round. If you’re like me and a relative low roller, bet small and cover a selection of numbers as well. This will keep your bankroll turning over if you play conservatively. You’ve got to be in it to win it, but don’t bankrupt yourself by doing it. Only gamble money you can afford to lose. My objective is to see my bankroll turnover and last so I get a crack at the bonus round. I’m playing for enjoyment and with 1 in 13.5 chances of getting Bonus round it’s a game I’m happy to play for a while. You never know what will happen if you get your timing right you. Having played Monopoly Live there is an alternative playing you could use. I mentioned before that Live Dream Catcher has better payout odds than the new live monopoly version. So, why not play Dream Catcher at the same time as Monopoly live. On Dream Catcher just place your bets on the wheel as you’d do normally. On the Monopoly Wheel only place bets on Bonus 2 Rolls and 4 Rolls segments. This is called hedging your bets. You benefit from the better payouts of Dream Catcher while waiting for the Bonus rounds to hit on Monopoly. Number 2 (Blue) occupies 15 segments. Pays 2:1. Number 5 (Purple) occupies 7 segments. Pays 5:1. Number 20 (Orange) occupies 2 segments. Pays 20:1. Number 40 (Red) occupies 1 segment. Pays 40:1. Number 1 (Lilac) occupies 23 segments. Pays – 1:1. Number 2 (Green) occupies 15 segments. Pays 2:1. Number 5 (Red) occupies 7 segments. Pays 5:1. Number 10 (Blue) occupies 4 segments. Pays 10:1. The chances of getting a feature of some sort on Dream Catcher Monopoly Edition is about 1 in 9 spins. That’s an average, sometimes it could be longer and sometimes shorter. There’s 54 Segments, 6 of which are features, so 54/6 = 9. The RTP for the whole game is best case 96.23% for optimal max bet conditions. At worst, minimum bet returns an RTP of 91.30%. This gives an RTP range of 91.30% to 96.23%, which is very similar to a lot of Slots. There is a 1 in 54 chance of getting the 4 ROLLS feature, 3 in 54 for the 2 ROLLS Feature. The returns are not the greatest by Live Casino standards, however this isn’t a table game so it’s not a fair comparison. Please Note: The Number Segments on the wheel and payouts are different from the original Evolution Dream Catcher. The Original Dream Catcher has an RTP of 96.58%. The Monopoly Dream Catcher wheel is divided into 54 segments. 48 of the segments are marked with a number (1,2,5,10) each with it’s own unique colour. The remaining 6 segments are divided between two CHANCE segments, three “2 ROLLS” segments and one “4 ROLLS” segment. The last two are the triggers for the bonus round. You place a bet on the number and/or segment you think the wheel will stop on. The wheel is spun by the live presenter. When the wheel stops on a number and you’ve bet on it, you’ll receive your stake back plus the pays of the winning number. i.e you’ve bet on 5 so you get your stake back plus 5 times your stake. If the wheel stops on a CHANCE segment everyone playing will receive a mystery Cash Prize or a Multiplier bonus for the next spin. When the Wheel stops on “2 Rolls” or “4 Rolls” and you’ve bet on those segments the RNG Bonus round is initiated. If you’ve not made a bet on these segments you’ll watch the bonus round unfold but won’t be able to take part. There are 48 Number segments on the wheel. 15 – 2’s (Green) pay 2:1. 7 – 5’s (Pink) pay 5:1. 4 10’s (Blue) pay 10:1. If you’ve bet on a number and the wheel stops on it, you’ll receive your stake back plus a multiple of the stake dependent on what number it is. There’s two CHANCE segments on the wheel, which when landed on will give all players a random Cash Prize or a Random Multiplier which is used on the next spin of the wheel. If players get another multiplier immediately following the first one the multiplier will be multiplied by that value. This is the first time we get to see MR Monopoly in Action as he reveals the random prize. This is where the Live Game departs into the world of 3D animation and the Monopoly Board game we’ve all been bought up with. 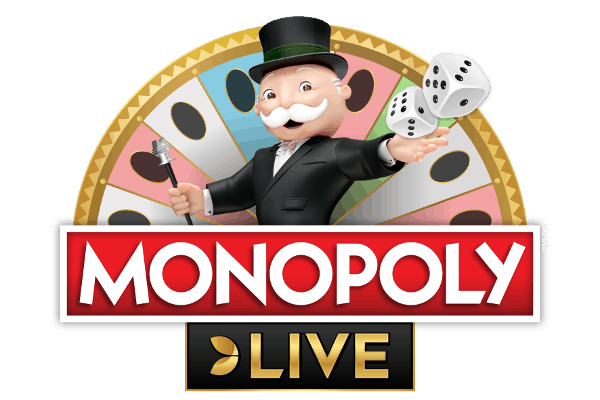 The Bonus game is triggered when the Monopoly Live Wheel stops on a “2 ROLLS” or “4 ROLLS” segment. Only players that have an active bet placed on these segments will qualify for the Bonus Round. All other players will be able to watch the bonus round but not take part. 2 ROLLS – If the wheel stops on 2 Rolls the Bonus round will last for a minimum of 2 rolls of the dice. 4 ROLLS – the Bonus round will last a minimum of 4 rolls of the dice. A double rolled during the Bonus round will add an additional roll of the dice. The Dice are rolled live in the studio by the game presenter. When the dice has been rolled MR Monopoly steps onto the board and paces out the number of squares equivalent to the total number on the dice. When he stops the prizes on the square are added to the players Bonus Win. The dice is rolled again and Mr Monopoly continues his way round the board until all the rolls have been used up. At this point the Bonus round ends and the winnings are paid to all the players taking part. 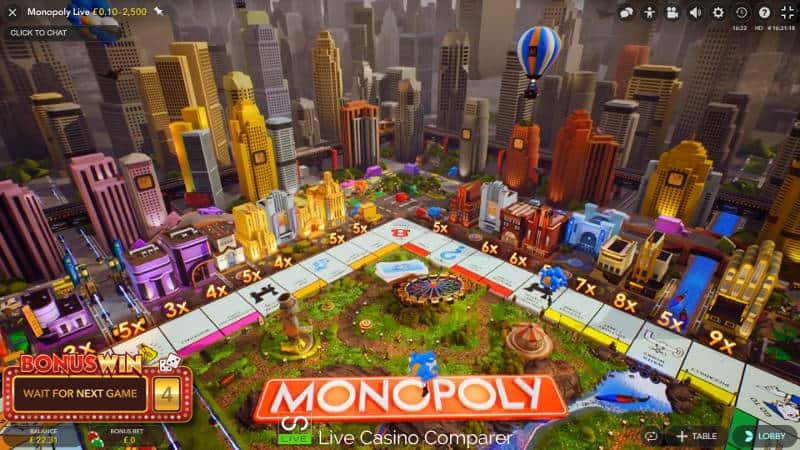 As with the original board game of monopoly the layout is the same, with all the normal game features being in play: Properties, Utilities, Free Parking, Go to Jail, Railways, Taxes, Chance & Community Chest and GO. Landing on any of these can have a positive or negative affect on bonus wins. As the Bonus round begins Houses & Hotels will be built n some properties that will increase the prize. If a double is rolled and extra roll of the dice is made, unless the double is used to get out of jail. 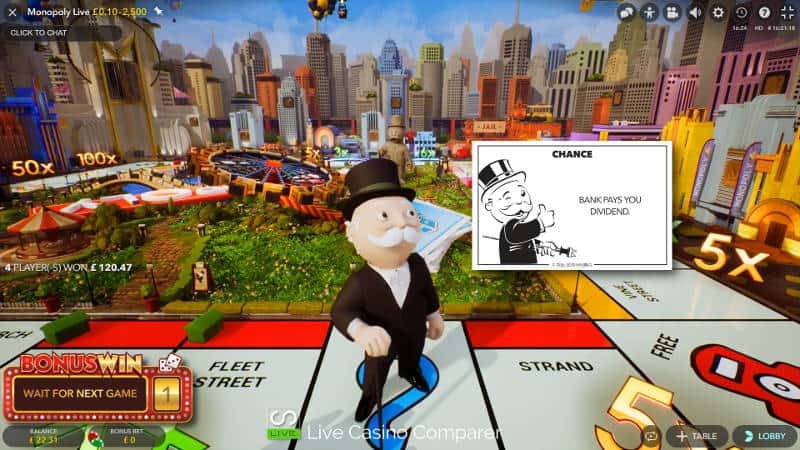 If Mr Monopoly lands on a Chance or Community Chest square the player will receive a prize or a fee to be taken from the bonus fund. The Income Tax square will reduce winnings by 10% while the Super Tax square will deduct 20%. All prizes are doubled if Mr Monopoly manages to pass GO. If MR Monopoly Stops on Go to Jail a double will need to be rolled to get out. Previous Bonus winning are not forfeited if you land in jail and will be paid. All device types can be used to play Monopoly Live Dream Catcher. Personally I think the game is best played on a Desktop or Laptop/Tablet. On these devices the screen is optimised for Landscape play. There’s 2 viewing modes which can be switched by clicking the camera icon. Players with a poor internet connection will be presented with the smaller classic view. The auto play functionality allows you to repeat your last best for a designated number of spins. Some countries get the additional options of being able to set win and loss limits as part of licensing requirements. It’s taken a long time to get to my summary. here goes. This is a game I wouldn’t ordinarily play, except the Bonus Round has changed that. 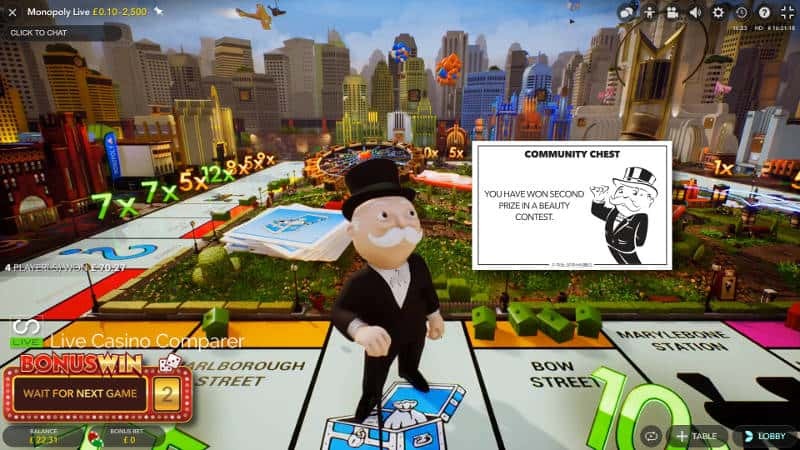 Seeing the cartoon Mr Monopoly pace around the Monopoly board collecting prizes and multipliers is something to behold. Having a few quid on it while he does makes it even more exciting. The goal is to get that 4 Roll bonus round. Perhaps the presenter will roll a double for an extra roll. Or you get lucky by Passing Go getting your bonus prize doubled. It’s new, it’s different and it’s worth playing even if you just want to experience it once. bet low and enjoy. I did.